How did you react when you received a celiac diagnosis? This might sound funny, but I had to have my moment of grieving that I would no longer be able to eat any breakfast cereal I wanted. Even many cereals I wouldn't have guessed have gluten actually do - like Kellogg's corn flakes which have barley listed in the ingredients. 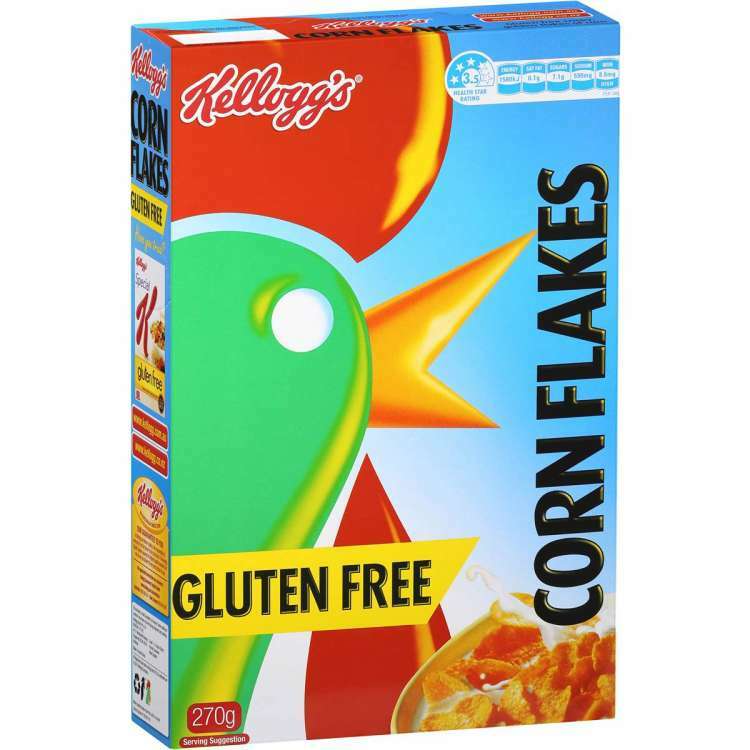 So I was excited when I found Kellogg's have a Gluten Free version of their corn flakes. At the same time I was kind of expecting a product that is noticeably different to the original. Because let's be honest, that is normally what happens with a gluten free version of something. In summary, I'm pleased to say the gluten-free version of these corn flakes taste the same as the original - in my humble opinion anyway. I think they keep the crunch a bit longer than other gluten-free corn flakes I have tried. They do cost more than the original - which is usually the way with these things. However, I don't want to complain about that too much because I am happy to see a company making gluten-free versions of their products. Please let me know your go-to gluten-free cereals in the comments. What is a cereal that you miss since going gluten-free? P.S. I have attached a pic of the Gluten Free version just in case anyone wants to get them for a family member. The packaging is quite different to the regular packet. You might want to say what country you are in. I haven’t heard about those in The US yet. Yeah sure. I found this product in Australia. If it's not in US yet maybe a few people suggesting it to Kellogg's might help the case. For example, in Aus, M&M's made here are not gluten-free. However, Aus just started importing the caramel M&M's from US and they are gluten-free. It's just a hunch, but I think the encouragement from the gluten-free community would have helped influence that decision. God I miss corn flakes I became allergic to corn about a year after diagnosis when I messed up. But I will go ahead and mention the alternatives you might try. Nuco Coconut Crunch, it is a low carb coconut flake cereal, (You can order on Amazon or LuckyVitamin Ships international) I up the realism by using either Capella Flavors Cereal 27 flavor drops (add to the milk or anything to make it taste like corn flakes) or oooflavors drops and choose the cereal I want and add to the milk first. >.> I also use almond or cashew milk due to dairy issues. Nuco Coconut Crunch, it is a low carb coconut flake cereal. I had a look for this product because I'm keen to try it. The recent reviews say they changed the recipe and it's not low carb anymore. Hopefully it still tastes good though because I want to try it. LIke really as a kid I would put sugar over corn flakes for lack of frosted flakes at my grandmas. Would think such a simple fix would work for most people instead of forcing everyone to eat the sugar added one. More and more I am pushed by life, be damn glad when my body kills me, nothing else is going right and stuff keeps getting taken away. Wow...when did these come out? It's about time!